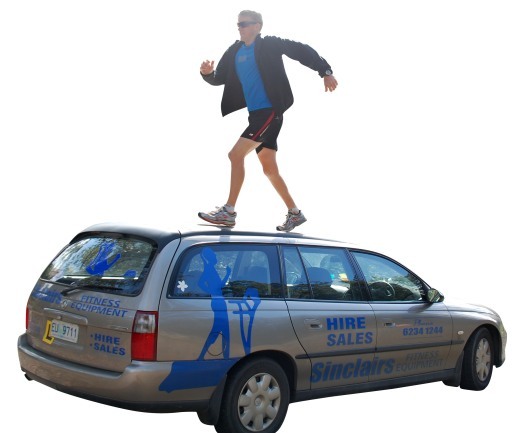 We sponsor a few things/people/teams/events here at Sinclairs Fitness. One of those was young Jack Sinclair’s solo 1,200 km run around Tasmania in 2011. He’s my brother’s son so we had to help him out! Anyway, a photo has just surfaced of Jack using the Sinclair’s support car we lent his mum when she drove up the West Coast so he didn’t die in the wilderness of exposure. No wonder we have to pay to get dents taken out! !